Naomi Watts likes to keep her skin guessing. "I think that skincare is a bit like working out," the 50-year-old actress recently told Into The Gloss. "You have to change it up every so often. I like to shock my skin into things—I don&apos;t want my skin to get FOMO." Fortunately for her, she gets to try all the new products she likes as a partner in ONDA Beauty, a new, New York City-based clean beauty emporium. That&apos;s right—after several years as a L&apos;Oréal Paris ambassador, she&apos;s now ditched conventional products in favour of a natural beauty routine. According to Naomi, they&apos;re much gentler on her skin. "As I&apos;ve gotten older, my skin&apos;s gotten more sensitive," she revealed to Vogue. "I&apos;ve been trying all of these things that are too harsh, and I react too much. I think if natural foods feel good in your body, then why wouldn&apos;t you do the same thing topically?" African Botanics Baobab Oxygenating Cleanser: "I use this cleanser every day. It&apos;s clay-based with baobab fruit extract, and I feel like my skin has really responded positively to it." True Botanicals Renew Nutrient Mist: "Then I do my routine. I use a mist, a serum or two, and oils. I really like this mist by True Botanicals." 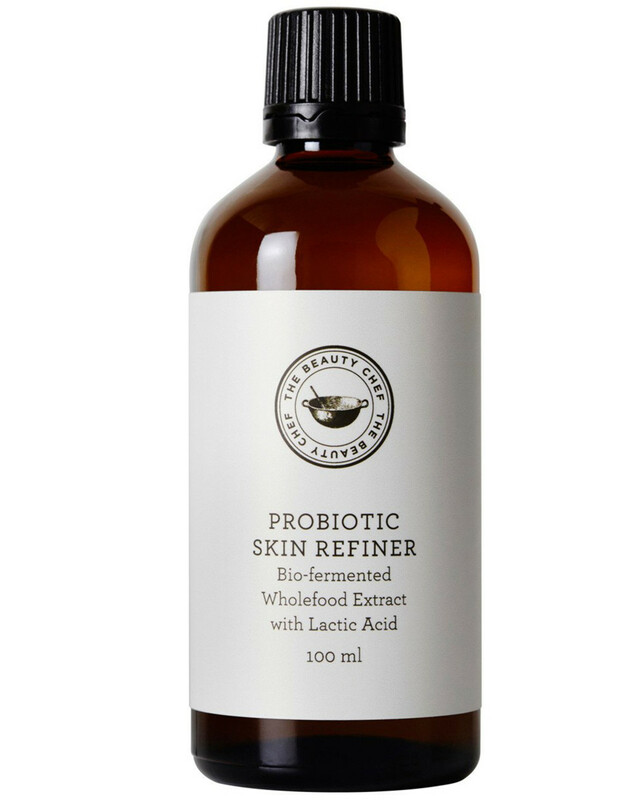 The Beauty Chef Probiotic Skin Refiner: "Sometimes I&apos;ll use this Beauty Chef Probiotic Skin Refiner as a toner instead. It kind of smells like vinegar. I either just splash it on, or you can use a cotton ball." African Botanics Rose Treatment Essence: "The rose water... is really lovely. It keeps your skin fresh." Joanna Vargas Daily Serum: "I love the Joanna Vargas Daily Serum—the smell!" True Botanicals Vitamin C Booster: "I&apos;ll mix [True Botanicals Renew Pure Radiance Oil] with their Vitamin C Booster." Vintner&apos;s Daughter Active Botanical Serum: "I&apos;m a fan of the oil serum. I mix it with a strong moisturizer and just pat it on. It makes me feel glowy; it&apos;s my most constant product right now." True Botanicals Renew Pure Radiance Oil: "I also like the True Botanicals Renew Oil." 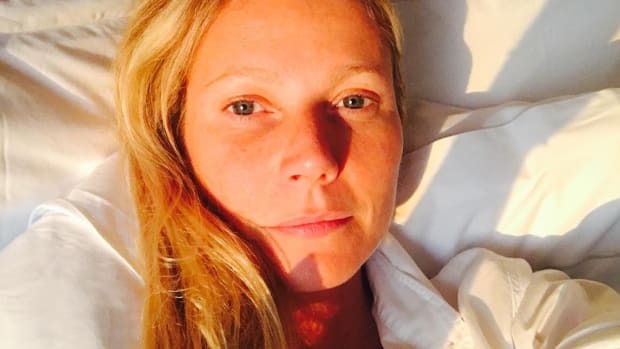 Goop by Juice Beauty Revitalizing Day Moisturizer: "I tend to mix [Vintner&apos;s Daughter Active Botanical Serum] with either the Goop Moisturizer or Angela&apos;s Soufflé Moisturizer. I just mix it in my hand—I kind of like making these little potions and mixtures. And then I press it on. Not rub it on, press it." RMS Beauty "Un" Cover-Up: "They do a great concealer that&apos;s also all-natural." Olio E Osso Balm: "[I like] products like that are easy—like RMS concealer and Olio E Osso lip balms." Face Halo Makeup Remover: "When I clean my face, I use these fantastic things called Face Halo—they look like makeup sponges, but they&apos;re actually to remove makeup. All you need is water, but sometimes I add a bit of cleanser, especially if I&apos;ve got heavy eye makeup or something. My friend actually owns the company, and she does this orange peel test—if you put foundation all over an orange peel and wipe it off with a regular cloth, the foundation stays in the pores of the orange. But if you use these microfiber things that they&apos;ve invented, it wipes off every last bit of it, even in the crevices." Angela Caglia Power Cleansing Balm: "I love this cleanser by Angela Caglia called Power Cleansing Balm with [the Face Halo]." May Lindstrom Skin The Honey Mud: "The Honey Mud from May Lindstrom is so good, too—more soothing." May Lindstrom Skin The Clean Dirt: "I love to mix May Lindstrom&apos;s Honey Mask with a little bit of The Clean Dirt after a long day. I like having glowy skin, and the addition of the powder gives a nice, gentle exfoliation." 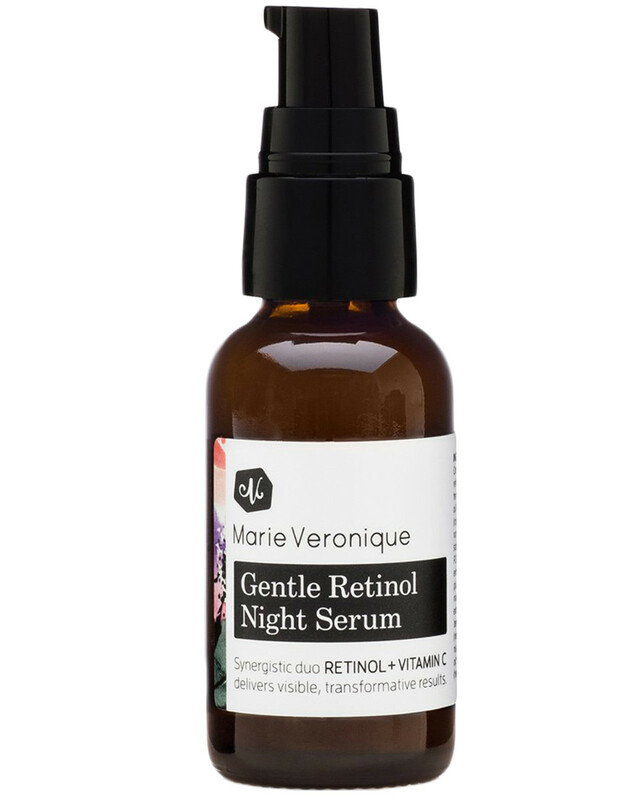 Marie Veronique Gentle Retinol Night Serum: "She has a few products that I use, like her retinol. It&apos;s a very active ingredient, and I use it nightly. I&apos;ve found that whenever I&apos;m using things with retinol, I&apos;d get very dry, so I don&apos;t want anything too harsh. I love this serum because it&apos;s so unlike other retinol products I&apos;ve tried, and is gentle enough to use every day. Retinol is really the thing that feels the most effective when it comes to anti-aging." Joanna Vargas Revitalizing Eye Cream: "Joanna Vargas has a lovely eye cream. I love all of her products." Joanna Vargas Exfoliating Mask: "For exfoliating, I use Joanna&apos;s Exfoliating Mask or the Instant Facial from Goop." Goop by Juice Beauty Exfoliating Instant Facial: "I&apos;m really into this Goop Instant Facial. 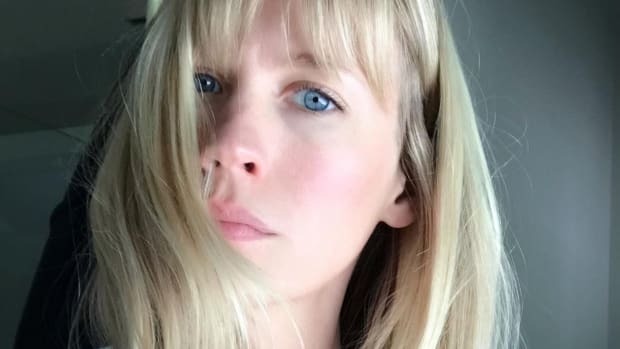 I think she did a great job—shoutout to Gwyneth. It&apos;s strong! It really does work as a zing-pick-me-up sort of thing. Fifteen minutes, it gets tingly and you can feel it doing very active things and you get very glowy." 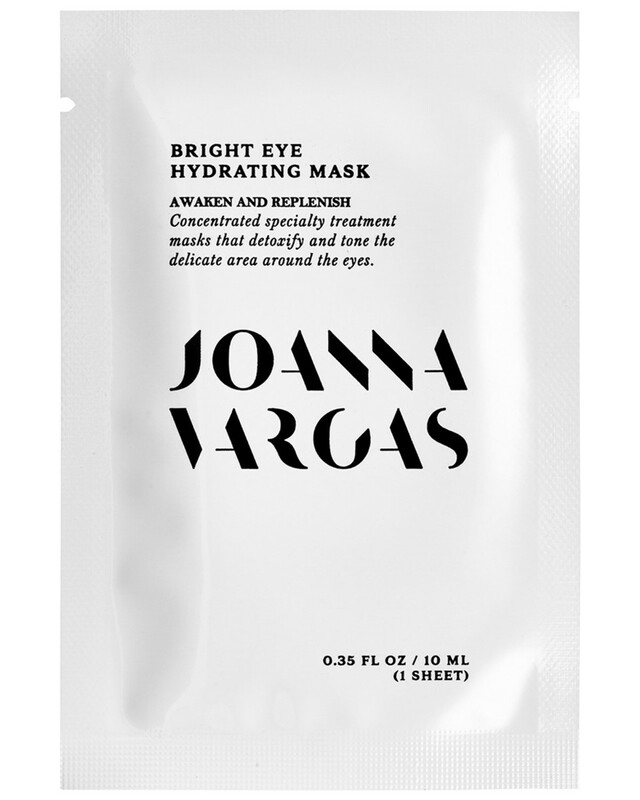 Joanna Vargas Bright Eye Hydrating Mask: "Joanna Vargas does some great masks." ONDA Beauty: "For facials, I go to ONDA, which is the new store here in Tribeca where I&apos;m a business partner. It&apos;s all about clean beauty, which I&apos;m really into right now. They have two great facialists, Angela Caglia and Viktoria Kroshyna. You go into that room for an hour and it&apos;s just really, really nice." Joanna Vargas: "I love her facials. She&apos;s a genius." Dr. David Colbert: "Sometimes I do something a little more intense than clean beauty—he has a Triad Facial that is a three-step program with some lights and things like that." "I try to eat healthily but I don&apos;t deprive myself, if I want sweet things I&apos;ll have it. I&apos;m naturally drawn to greens and often whizz up a green juice for breakfast. I&apos;ll throw in kale, walnuts, yoghurt and pineapple into my Vitamix." The Beauty Chef Hydration Inner Beauty Boost and Collagen Inner Beauty Boost: "I don&apos;t have oily skin by nature, so a capful of the Hydration and Collagen Beauty Boosts in my water every morning has really helped me." The Beauty Chef Body Inner Beauty Powder: "This is a great way to start the day. I mix mine with kale, pineapple, and berries in a smoothie." Herbalore Catalyst Gold: "To fix [thinning hair] I’m taking vitamins—I just started with Catalyst Gold ones and I am seeing some changes." The Class by Taryn Toomey: "There&apos;s a woman in New York named Taryn Toomey who has these great classes. It&apos;s balance, yoga, cardio and music and it really speaks to your mind." Yoga Vida: "They&apos;ve just opened a new yoga studio in my neighbourhood called Yoga Vida, and that&apos;s great—just being able to walk there." Herbivore Coconut Milk Bath Soak: "This stuff is really good for soaking. I try to take a bath every night—I&apos;m a bath person. That&apos;s the English in me." Thanks to Into The Gloss, Well+Good, InStyle, Harper&apos;s Bazaar, NewBeauty and Vogue. What do you think of Naomi&apos;s routine?